1. The email of a guy in Lost & Found who speaks English. I’m supposed to email him to see if the camera arrives. 2. The fact, according to English speaking guy, that things like cameras do get turned in sometimes–even wallets with money in them. 3. The knowledge that your tax dollars are hard at work–apparently if lost items are found the Lost & Found cannot ship them to the US. It us the US Embassy that has to pick them up. “Oh great,” I said, upon hearing that news. Really?! I wonder who has that job…? How better to spend the last day than in search of my camera at the Paris lost and found…? Actually, we had a nice breakfast out in the Marais, and I’ve just dropped my mom off at the Picasso Museum–supposedly the best collection of Picasso in the world–while I’m making the trek back to the Paris Lost and Found. We did go on Friday, in search of my lost camera, but were told that was much too early for it to be there. I’m not all that optimistic that it will be there, but it seems worth at least checking. Supposedly things do show up there, so I guess we’ll see. Day 29: orsay did you see? Today was a beautiful, sunny day in Paris. Guided tour of the Louvre (last time I went to the Louvre it was basically to see the Mona Lisa and leave, so this time was a bit more thorough, though at only 1.5 hours, only saw a tiny fraction of what could be viewed…and I’m probably okay with that! Ice cream from Berthillon (recommended by Rick Steves and my good friend Julianne). I had coffee and chocolate. Yum. We tried to go see Sainte-Chapelle but the line was really long so we did not wait. We’ll see if we can get in tomorrow. When I was here five years ago, but in February, we walked right in. Dinner at Chez Lena et Mimile a cute place we had seen a few days back and managed to find again, based on a photo my mom had taken of the awning. The photo did not have the full name of the place, but did have the phone number, which I was able to google and get the address. In addition to a delicious dinner (we both had ‘gambas’ (shrimp) with risotto) we tasted a fine pastry from the ‘picasso of pastry’ Pierre Hermé. To cap off the evening we decided to take another boat tour (we took one the day my mom arrived, during the day) so that we could see the Eiffel Tower lit up at night. The boat tour did not disappoint–the Eiffel Tower views, with the moon alongside, were spectacular. We would up sitting next to a couple from Sherman Oaks, and a few rows in front of many young school children, all in matching red baseball caps, all hooting as we went under each bridge, until an announcement came on in French that, based on their subsequent silence, must have reprimanded them. Today my mom and I took the RER C out to Versaille for a day of touring the opulent palace and gardens that go on forever–and we walked most of that forever! This time, though, the fountains were on in the gardens and it was a pretty spectacular sight. I’m still not that into the inside of the palace, but my mom and I spent about three hours walking around the gardens, to the far corners, seeing Marie Antoinette’s area, which was actually quite beautiful. We did make sure to take our picture with the Daily Pilot (our local paper), in hopes that we might get it published, as they print photos of Daily Pilot readers from around the world. 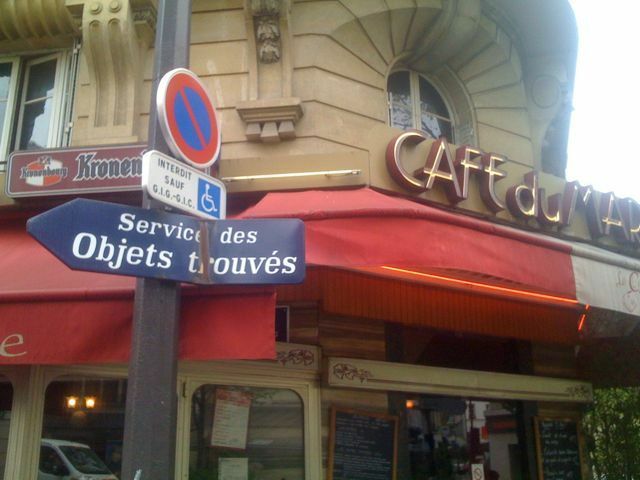 I know, I know, who goes for Mexican food in Paris anyway?! I guess I had gotten cocky after having great Mexican food at Miguel’s in Chiang Mai and at Boojum in Belfast. No more lollygagging…if we’re going to see the museums of Paris, it’s time to get serious. So, today, we started off with the Musée de l’Orangerie, arguably one of the best collections of Impressionist art anywhere (except for, perhaps Musée d’Orsay which is on the schedule for Tuesday). After a yummy potato omelet at a cafe alongside the Pompidou Center, we hopped on the metro toward Concord. The metro we happened to hop on came with musical entertainment–a man, his electric guitar, and an amp, serenading the passengers with Spanish songs. It was surprisingly good, and definitely an enjoyable start to the day. After seeing works by Monet (like), Utrillo (like–we saw a painting of his with the very view from our dinner table in Montmarte last night! ), Renior (not a big fan), Matisse (like, but a bit odd), and Picasso (never knew he did non-cubist stuff) we headed to a cafe in the Tulleries garden for a snack–beer and french fries. From there we decided to walk up the Champs-Elysees, with a brief detour to see some more Monet (for free!) in the Petit Palais, and a view of the Invalides and Eiffel Tower from the pont Alexander III. The walk from the Tulleries garden toward the Arc d’Triumph, took us past the US Embassy (no pictures allowed?! ), through gardens with blossoming tulips (and other flowers, but I don’t know their names) and gi-normous artichoke plants. There were also TONS of people walking along the Champs-Elysees, in both directions. We decided to stop for a bite to eat (salad, pizza, red wine) at a restaurant just before the Arc d’Triumph, figuring we might need the sustenance for the 284 step climb to the top. When you eat at outdoor cafes in Paris you are basically lined up, perched at tiny round tables, facing the street, watching the people go by. If you are one with a need for a lot of personal space, this is not for you. We were close enough to our neighbors for me to know that on one side, they were from Ireland and on the other side, for the guy to offer to pay me for my mom (I said I’d sell her for 200 euro, he offered 300. So, though it was great to hang out with her in Paris, looks like I’ll be alone…kidding). Once at the top (with a few rest stops up the 284 stairs) we were treated not only with the expected 360 views of the city (though a bit hazy) but also with a girl band, wearing silver/white ‘bob’ wigs, playing trumpets, tubas, drums…still not sure why, as they were not collecting money, but everyone up at the top gathered around listened, and joined in the fun. From the name on the drum they appear to be les muses tanguent. So, all in all a great day, book-ended by two impromptu, free, and fun in their spontaneity concerts! Today was a full day of touring–and it’s after midnight, so we’ll see how coherent this post is! Apparently there were these priests who really liked these meat pies from a particular vendor, who was good friends with a particular barber, who seemed to ‘lose’ his clients quite regularly. Well, even though the priests did not know that they were eating meat pies that were a bit too realistically the body and blood, they were excommunicated for having eaten human flesh. Having no other income, they became beggars but one day a bishop came long their street, heard the story, and allowed them to open a market to earn a living. This street is still a market street today. Rather than take our chances, we decided on some delicious looking but definitely vegetarian pizza. The guy who gave us our pizza asked, “Where are you from?” When I said, America, California, his first response was, “What do you think about your president?” In every place I’ve been along my trip people have asked me that–one guy, a Frenchman sitting next to me on the plane from Bangkok to Cairo, even shook my had to congratulate me for helping to elect Obama. Well, when the pizza guy asked us, I said I was very glad, but admitted that my mom is less than enthusiastic. He proceeded to tell us his opinions on the subject, which I happened to agree with, but which were entirely unprompted. It’s fascinating how willing, and how eager people are to talk about subjects that might be shied away from at home. After our visit to the lost and found, we stopped for a rest at this cafe where the man next to me, 83 and with a heart transplant (at least that's what I think he said, in French) befriended us. We finished off the day with a Rick Steve’s recommended bus tour, and dinner in Montmartre after an evening view of Paris and a walk through the Sacré-Cœur–a quick one, since we were hungry after so much walking, touring, and only a bit of pizza at lunch! The walk back to the metro from the Sacré-Cœur was thru the Pigalle area, including the Moulin Rouge as well as many establishments that my mom and I were not going to visit!